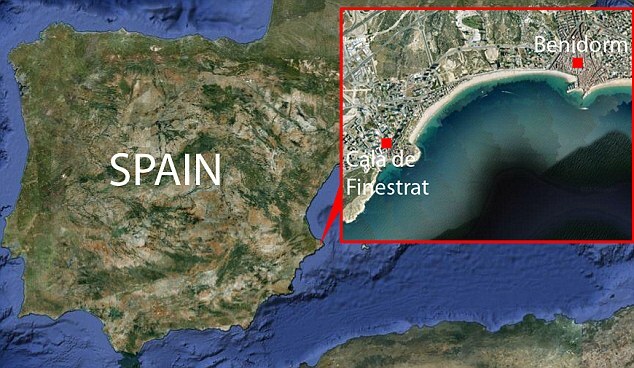 A British couple have been killed in flash floods following torrential rain in Spain. 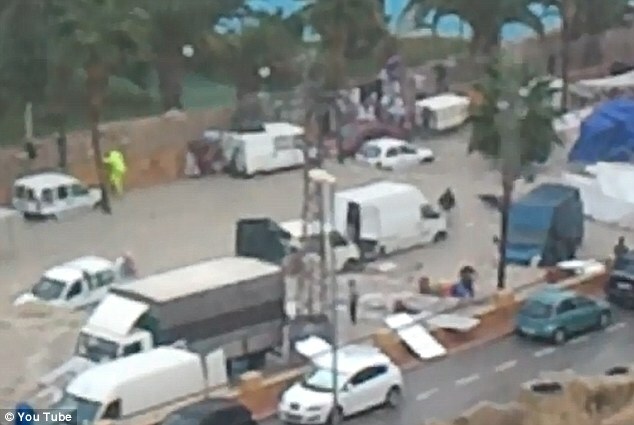 The married holidaymakers, aged 72 and 70, were seen clinging desperately to parts of a market street cafe in the quiet seaside resort of Cala Finestrat on the Costa Blanca. According to one eyewitness, a market stall, which was being washed along by the flood water, smashed into them and carried them away. 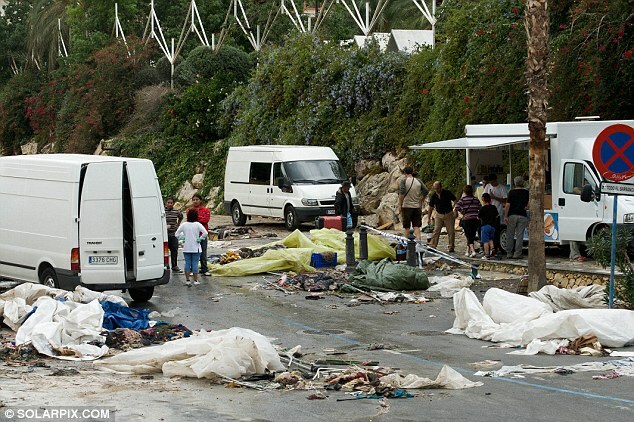 It has now emerged that the town's council was fined 83,000 Euros in July 2010 for asphalting the bed of the ravine, where the market was held, without permission. Dramatic new footage has emerged showing the ferocity of the flood water. In a four minute video the brown water carries away cars, furniture and viewers can see frantic people wading through the path of the flood trying to grab possessions. 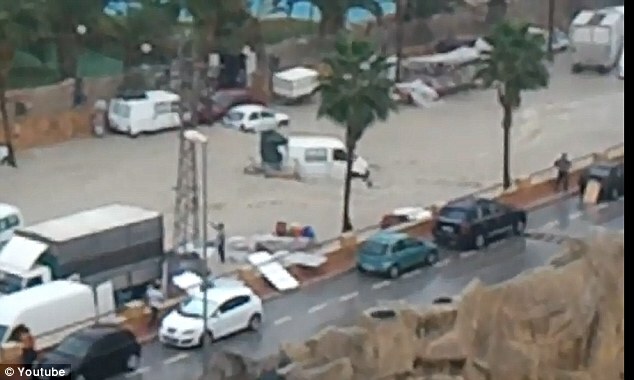 In one section of the video people are seen trying to gather items from lorries and cars as the water carries them off. 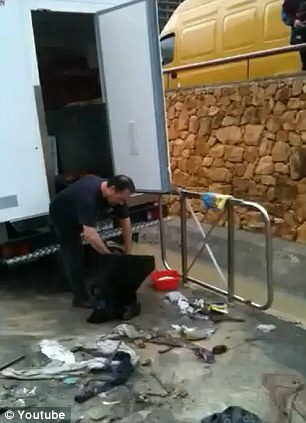 The town council had also been warned by the Spanish government's Ministry of Environment not to hold public events there until further works had been carried out - and was told it would have to pay damages for any incidents that occurred. The couple have not been named. The cafe owner was also washed away but managed to save himself. The regular Friday market has around 150 stalls and is popular with British tourists and expats. 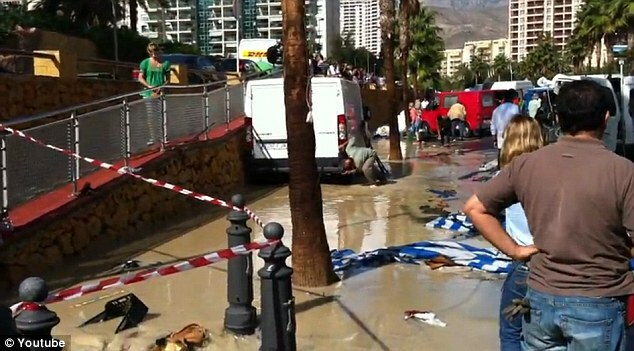 Five other people were injured in the floods at Cala Finestrat, two miles from Benidorm, on the south east coast. 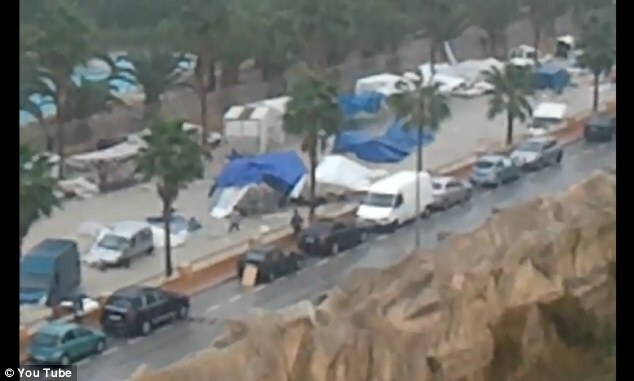 The flooding followed two hours of heavy rain this morning and swept away cars and market stalls. 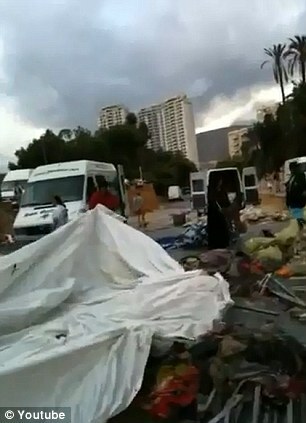 Huge amounts of water ran down a ravine and into the market at around 11.30am. The area saw 7.2 litres of rain fall per square metre in just 25 minutes. 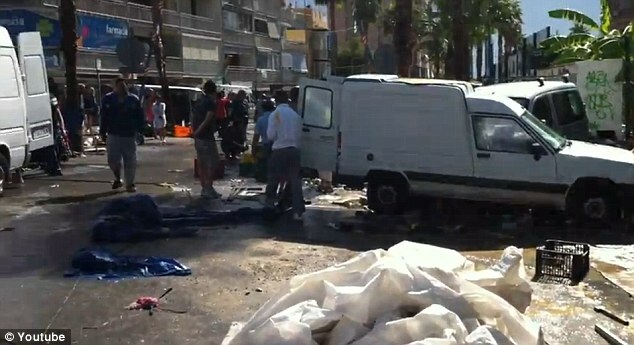 Government spokesman Jose Perez Grau confirmed the dead couple were a British man aged 72 and his wife aged 70. He said the intensity of the rainfall had 'come from nowhere' and had made it very difficult to predict. Spanish newspapers reported that emergency alerts were usually set off when 40 litres of water fell per square metre - and as it was just 7.2 litres this did not happen. Footage on the internet has revealed that the town has suffered with flash floods before, most notably in 2007 and 2009. An 88-year-old man was taken to hospital with a broken arm and a 51-year-old was hospitalised with severe cramp. A 90-year-old Spanish woman feared missing in the flood was found safe. Market trader Blanca Maria said she and others had previously complained about the risk of flooding because of the position of the market near the ravine. Other traders complained that emergency services took too long to arrive at the scene. 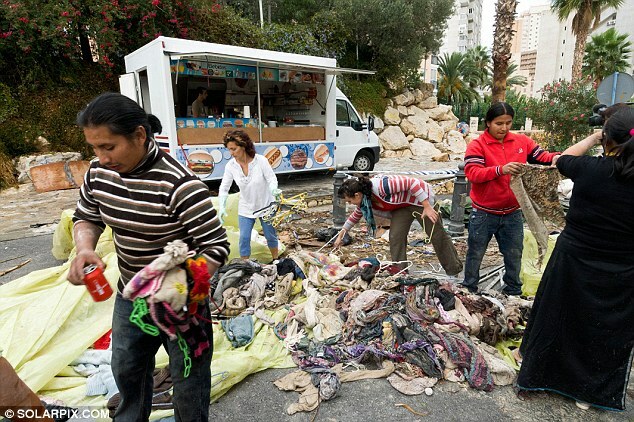 Luis Alberto Lamchimba, who sells textiles from his stall, said the flood had cost him 10,000 euros worth of stock. He said there would be two days of official mourning following the deaths and that flags around the town would be flown at half-mast from midnight tonight for 48 hours. News agency Europa Press has reported that the town's council was fined 83,000 Euros in July 2010 for asphalting an area around the market without permission. 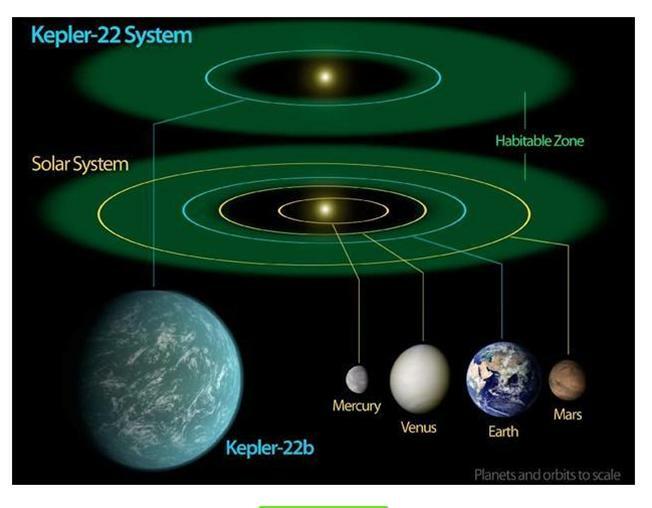 It had also been warned by the Spanish government's Ministry of Environment not to hold public events there until further works had been carried out - and was told it would have to pay damages for any incidents that occurred.